Quilts of Valour Australia Inc. Welcome to the new look website. Many thanks to Timothy Comport for updating our new look website. This is now hosted on cloud which should make it user-friendly for adding information. We welcome your feedback. It is over 7 years since the inception of Quilts of Valour Australia Inc and during the past year we have reached all over Australia with Coordinators and Representatives in every State and Territory. In Victoria we have Wyn Roper (President), Helen Comport (Founder/Secretary), Jennifer Ray (Treasurer), Lyn Clissold (Minute Secretary) and Committee Members: Jan Penpraze, Dorothy Meadows OAM, Norma Aitken and Rosemary Kreun. We have Representatives Margie and Howard Tily. In Queensland we have Barbara & Bill Kenny (coordinators) with the following Representatives: Lynda Miller, Bern & Barry Johnson, John & Naomi Enchong and Vicki & Warwick Venables. In New South Wales we have Stan and Sue Allen (Coordinators) and Representative Lorraine Kool. In Tasmania we have Christine Cutler (Coordinator) with the following Representatives: Dwayne Cashman and Phil Bowerman. In ACT we have Representative Kathryn Doyle Hailey. In NT we have Representatives Pam and Ray Palmer. In SA we have Representative Rita Young. In WA we have Representative Kate Saunders. Thank you so much to all these generous people and others who contribute so much to help us reach Defence Personnel and Veterans touched by war. We welcome interest from others wishing to become more involved with Quilts of Valour Australia Inc.
Our most recent brochure offers information for our contacts around Australia. We have introduced email addresses for each State which will allow interested people to directly contact someone in their State. We are grateful for all the support given by so many in our community. Thank you to all the many individuals, Patch workers, Long Arm Quilters, Patchwork and Quilting groups and many financial donors. Some major financial and goods sponsors in the past year include Cabra-Vale Diggers (Campbelltown NSW), Smithfield RSL Sub-Branch (NSW), Inner Wheel Club Nepean (Vic), Inner Wheel Club Cranbourne (Vic), Lions Club of Herberton Inc. (Qld), National Seniors Australia Calamvale Branch Inc. (Qld), Masonic Lodge (Victoria), Tony Sullivan Victorian Textiles (Vitoria), Officeworks Stores and the Harkaway Hall Committee (Victoria), Beaudesert Ladies auxiliary (Qld), Mreeba Lioness Club (QLD). I will add a Sponsors page to our Website soon. The rate of Quilts being awarded around Australia has increased. In excess of 1000 quilts have been awarded to immediate families of fallen soldiers, Serving Defence Personal touched by war and veterans touched by war. The feedback is always the same. The recipients are overwhelmed by the outpouring of love and kindness given by other Australians to thank them for their Service, Sacrifice and Valour. In Victoria 6 Dignity Quilts were made for RSL homes. A Dignity Quilt is a special quilt that covers a deceased veteran on a pall as he / she is removed from their residence after their death. The Dignity Quilt covers the body on a stretcher. It is intended to add dignity and reverence to the passing of a veteran. 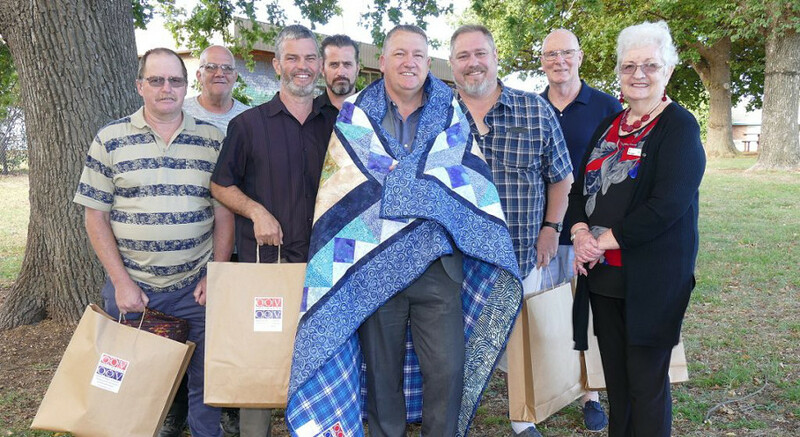 In 2016 Quilts of Valour Australia made five Dignity Quilts for Vasey RSL Care Pty Ltd. One quilt for each of their five accommodation residences around Melbourne. The design of the five identical quilts is symbolic of our gratitude to the service of each veteran and their links with Australia. The centre of the quilt has three embroidered emblems – Navy, Army and Air Force. These represent the three arms of Australia’s defence services. Around this centre are nine patch blocks that have a cross in the middle of each to represent the deceased veterans. Next around those blocks are triangles called “flying geese”. These represent that fact that the deceased veterans are flying free from their earthly body and pain. The final outside round on each quilt has arrangements of Australian wildflowers to represent the veterans’ links with our country and its wonderful wildflowers. 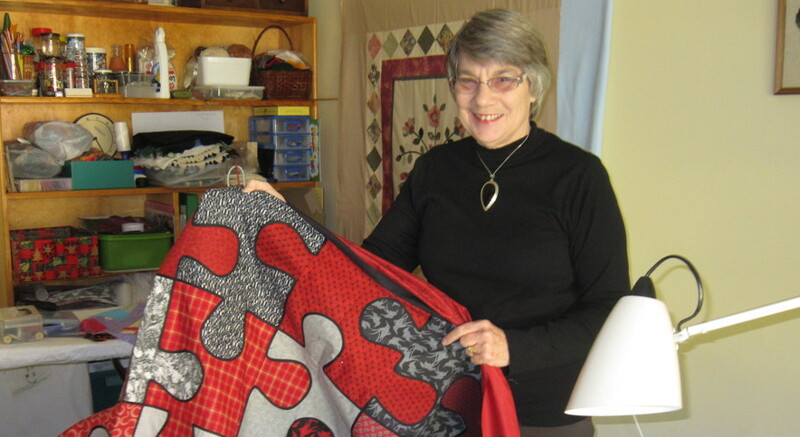 The design of the quilts was created by Wyn Roper and Sharon Siacci. The fabrics for these quilts were provided by Chandlers Cottage in Victoria at a generous discount. The fabrics are from the “Under the Australian Sun” range. The wadding is Matilda’s Own 80 / 20 wool. The quilting was done by Sharon Siacci and the embroidered emblems were done by Zen Promotional of Mildura. Six quilters were responsible for the piecing of the five quilts. Many thanks to everyone involved in this project. We have enjoyed 2 Quilt-Ins each year in Victoria. Each time Harkaway Hall committee has given us the use of the Harkaway Hall at no cost. We are really grateful to them for their support. Our next Quilt in will be in October. When the date is available I will add the information to our website. Many awards have been made with volunteers from different parts of the State personally awarding the quilts either in homes, at gatherings or in hospital. When permission has been given photographs of these awards have been put on our Facebook page. Quilts have been sent from Victoria to all States and Territories for awarding. It is wonderful to see that NSW and Queensland are growing so well that they are producing enough quilts for their States. Wyn Roper awards well deserving quilts to veterans at Bairnsdale Victoria. Wyn and Helen award a quilt at Yarram to a Vietnam veteran, Norm Harrop. This magnificent quilt was made by Margaret Bloore. WW11 veteran Tom Jones receiving his quilt. Pictured is the quilt maker, Dorothy Meadows OAM, Tom Jones, Longbeach RSL President Michael, and Wyn Roper. Tom Jones is a wonderful 95 year old gentleman. Margie and Howard Tily awarded quilts to well deserving veterans at Morwell RSL in Victoria. In NSW 53 Quilts have been awarded during the past year. These awards are regularly posted on our Facebook page. Stan and Sue are looking forward to spreading the word at Inverell Quilt show Friday & Saturday 20 & 21 October later this year.. 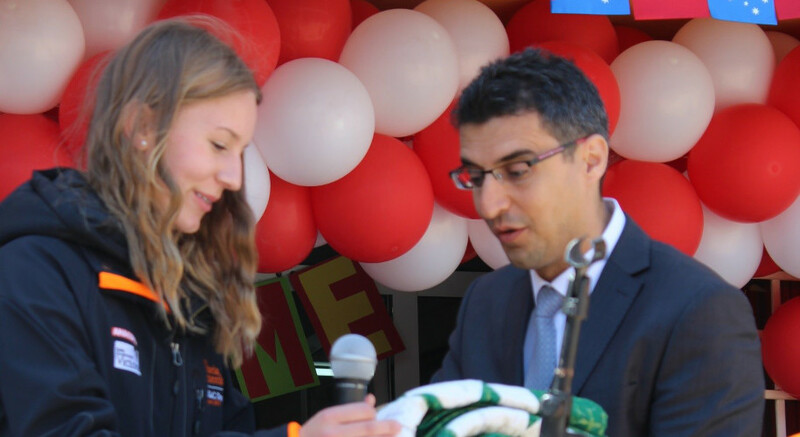 They are also visiting Tenterfield during October to welcome on board a new quilter and presenter … Mrs Janel Holmes. Sue and Stan awarding a quilt to Gary Aitken. Two years ago Gary rejected a Quilt of Valour because he thought he “wasn’t worthy” but when Stan saw him in April this year he divulged that he had Pancreatic Cancer and not long to go, Stan convinced him to take the award, if not for himself, then for his family. The award happened 21st May at beautiful Mt Annan Gardens in front of his family. Gary passed away 6th July with his Quilt of Valour over his bed. His wife wraps herself most nights in that quilt and finds comfort, such is the power of the quilt. Stan and Sue awarding a quilt to Jack Ebzery WWII in the presence of radio announcer Malama Psarianos. Our NSW coordinators have attended a Quilt Show in August 2016 and the Mad Quilters Show this year. These were successful in raising awareness of QOVA. Some quilters and also some Long Arm quilters added their names to our volunteer list. Many people gave monetary donations to help with our costs. They have also had information pop-ups at shopping centres. On the 18th August 2017. Vicki and Warwick Venables and Bill and Barbara Kenny attended the Long Tan commemorations in Brisbane at St Johns Cathedral and afterwards lunch as guests of the Long Tan Association. 16 quilts were awarded to 13 veterans and 3 in memory of deceased veterans. Many Requests come from Vietnam Veterans, Veterans Motorcycle groups, Veterans Care and the RSL. QOVA will have a stand at the ‘World of Craft Show’ at Brisbane RNA in September. Donations in Queensland include 100 Quilts, many pillowcases and lots of help binding and Long Arm quilting. A beautiful poppy quilt has been made to be used as a banner for group. Queensland have sent quilts to the Northern Territory and many parts of Queensland for awarding. School involvement. Students from Beaconhills College (Berwick, Victoria) have learnt patchwork during lunchtimes and completed a quilt which they awarded to a young veteran at the College Remembrance day Service on 11th November 2016. Young Veteran Warrant Officer Class 2 Colin Rout receives the quilt made by the students in front of the school assembly. The pattern was designed by Wyn Roper, our President. We welcome photographs and reports of your activities on behalf of Quilts of Valour Australia. Please send any contributions to Helen Comport through our contact page. Thank you so much to everyone involved in ‘Quilts of Valour Australia Inc. for helping to honour the Service, Sacrifice and Valour of all soldiers/veterans who have put their lives on the line for our country. We have a growing and diverse community of volunteers with rich stories, ideas, and inspiring projects. During the last year Quilts of Valour Australia has grown and spread into more Australian States. 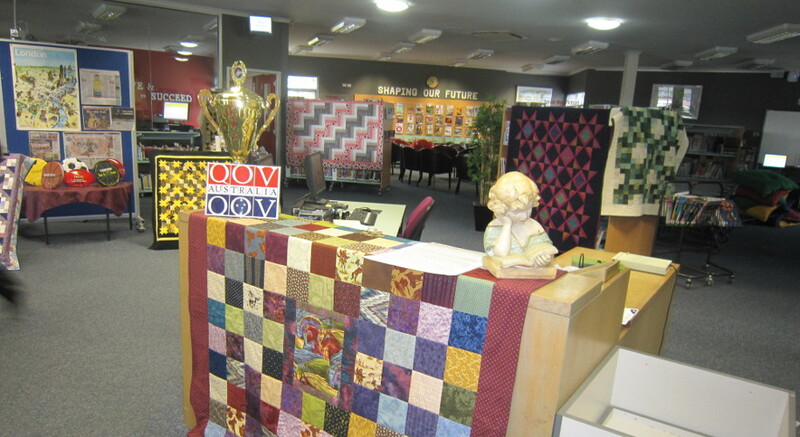 During August 2012, there was an exhibition of some of the donated quilts in the Library at Beaconhills College, Berwick, Victoria, Australia. ©	Copyright © 2016 Quilts of Valour Australia. All Rights Reserved.